Now I kinda like what the Patriots are doing. I hated the Randy Moss trade, every single aspect of it. The timing (coming off their biggest win of the season) was odd, the compensation weak (certainly the desperate Vikings could have been talked up to a second rounder), and most importantly, Moss remains an elite scoring threat. Bill Belichick’s six-minute press conference (which he said he called to “shed light” on the trade but which did no such thing) only served to heighten the confusion. Would this man really make fun of somebody else's hair? Then Belichick bolted from the podium, leaving the press with the old Holmesian truism: Once you have eliminated the impossible, whatever remains, however improbable, must be the truth. 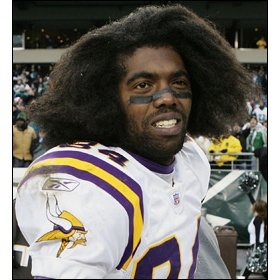 All other possibilities exhausted, Randy Moss must be pregnant (it does explain the moodiness). There are more rational options, of course. Moss, talent though he is, is an odd fit in the Patriots offense. His blocking is comical. He’s a meager threat on end-arounds, slip screens or slants. And when he does catch that five-yard slant, it’s typically for a six-yard gain. Compounding this is Moss’s own self-image. He was a once-in-a-lifetime athlete with skills so immense that throwing to him in single coverage deep seemed a higher percentage play than to say to a wide-open Jake Reed underneath. How can you be that great and not feel self-entitled? You’ve seen the NFL Films shots of him going up and down the Vikings sideline clamoring for the ball. He was that good, he wanted to win, he knew what he could do with the ball if he got it, and he wasn’t getting the ball. It had to be frustrating. He was so good that one coach, Mike Tice, coined the term “The Randy Ratio” for that practice of trying to get the ball in Moss’s hands 60% of the time (the term “Telegraph Tice” was coined the same day). Then there’s the double coverage. Even at 33, Moss draws more than his share of it. The conventional wisdom is if Moss is doubled, he’s done his job, whether the ball’s coming his way or not, and whether he keeps running mid-play or not. But there’s only so much of this a player wants to deal with before wanting to touch the ball again, hence the maddening Brady attempts to Moss in double coverage or on fruitless bombs. Finally, there’s the money. Playing out a contract year, with a 2011 lockout looming, there’s the possibility of not signing another deal until he’s 35. He’s understandably nervous*. * The Globe’s Shalise Manza Young last week had an anonymous source claiming Belichick told Moss in the offseason that he wasn’t part of the Pats’ future plans, but then coming back during camp to talk contract. The source said Moss told Belichick he wanted to wait until after the season. If Moss didn’t want to negotiate a new deal, why would he complain post-Bengals game about not feeling wanted? It doesn’t make sense. So no, Moss isn’t pregnant, but he’s still expecting. He expects to see the ball, he expects to get paid, and like he said after the week one victory, he’s expecting to be told he’s still wanted. Moss’s time in New England was a godsend. It rejuvenated his career and legacy, and for a while his image. But for the 90% of Moss bad behavior rumors that aren’t true**, the 10% that are true*** have people believing they’re all true. ** Going toe-to-toe over personal grooming, Charlie Casserly? That was laughable on its face, especially considering Moss has had his own share of bad hair days. Moss said he wanted to stay in New England and he said he wanted a new contract. Now he’s got neither. New England was his best chance – unless the win-now Vikings win now – at a ring, plus everybody’s back to thinking he’s just a diva. Meanwhile, Deion Branch’s own diva behavior is all but forgotten. He took a pay cut, he accepts his role, and he wishes he never left. All is forgiven. Branch makes sense in New England, because he’s one of the interchangeables. That receiver screen could come to Welker with Branch and Tate blocking, or to Branch with Edelman and Welker blocking, or to Tate, or to Edelman, or to Woodhead, or to Hernandez, ad infinitum. Their receivers now all play flanker, they all play slot, they all play split end. And the only expectation is that the open man gets the ball. This was a familiar refrain. One of the hallmarks of the 2001-2004 Patriots was a baffled media and a defeated opponent locked in denial. To them, whatever way the Patriots won, it couldn’t possibly have been earned. So they fell back on the old standbys: the refs, alleged cheating, or the favored team simply having a bad day (memorialized by Kordell Stewart’s AFC Championship Game chestnut, “Sometimes the best team doesn’t win”). These are moments to be savored. This is where we want the Patriots to be – flouting convention – and where we want the league to be in relation, always in disbelief at what just happened. In 1995, Bill Parcells was trying to talk running back Leroy Thompson into staying on with the Pats. Thompson was fresh off a 65-catch season, and Parcells told him if he could accept a certain role – much like Dave Meggett had done with Parcells on the Giants – there was a place for him here. Thompson balked, envisioning himself as a feature back, and so signed with Kansas City. He was out of football in two years. I imagine Belichick and Moss had a similar conversation; that Moss was told he would no longer be a focal point of the offense, but still was quite valuable. And I think, still wanting desperately to win and still thinking he was the best means to that end, Moss demurred. It’s a shame it didn’t happen for Moss in New England. But then, the one thing he could never outrun was himself. This was really well written. The last 5 paragraphs are tremendous. Good analysis and very entertaining. Really enjoyed this article. Very level headed.